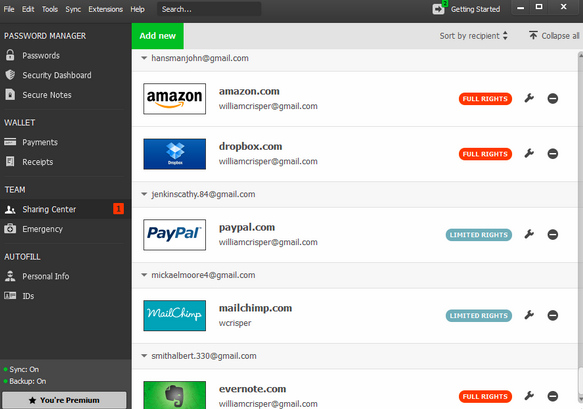 Dashlane is a password manager and secure digital wallet. It was created for the 2+ billion consumers that use the web each day. Dashlane helps people who feel it as a pain to remember passwords. The various products that Dashlane offers are Password Manager, Autofill, Digital Wallet, Dashlane Security, Dashlane Business and Free v. Premium. If you have a problem with your account the company offers a support website that answers common issues and problems. Unfortunately, there was no corporate office address or customer service number listed on the website. The BBB lists Dashlane headquarters at 156 5th Avenue, Suite 504, New York, NY 10010. The executive to escalate complaints to is Mr. Emmanuel Schalit, CEO. I have been using Dashlane for a couple of years without any problems and recently they made upgrades to the software and now it doesn't work properly. It doesn't auto-fill websites. I have complained to them numerous times without a resolution. I wanted one year of Dashlane. However, they charged me for five years. I am trying to contact them by phone but they do not have a customer support number. This is unacceptable in this day and age. My computer crashed. I had to go to factory reset. I reinstalled Dashlane. I entered the Master Password. Dashlane required I ALSO enter a security code which they sent to my email. HELLO! My email is protected by a Dashlane password which I cannot access Why? Dashlane will not permit me to login even though I have my master password!! An SOS was sent to Dashlane. Alas. Dashlane responds in their own good time,IF AT ALL!. Thus far, I have been waiting in excess of 36 hours. I expect, if I hear from them at all, it will be another three days - past this weekend, that I hear from their "customer service." In this instance, I AM holding my breath. I need to resolve this issue, contact customer service, or can all my work and go another direction. Dashlare is the best password keeper that I have come across. It has a real good user interface which is user friendly. It has additional room for your various IDs, credit cards and other payment methods, receipts, and notes. I am currently using Dashlare as it secures every password that I use for various products. It has the optional cloud synching that is a unique feature. Setting up Dashlane is super easy. I have done it in just minutes. The installation was done step by step so it was easy and fast. Dashlane can automatically add new credentials upon logging in to websites, so after using it for several days, most of my oft-used passwords were transferred to Dashlane without much effort on my part. I highly recommend this to all to safely secure your passwords.